Regardless of which kind of fish you enjoy eating, there are a variety of different ways to prepare it. You can make fish quickly or let it cook slowly over a longer period of time. No matter how you go about doing it, you can cook a healthy fish dish and enjoy it after a long day out on the lake. Check out some of the best ways to cook fish below. Grilling fish is one of the best ways to make it if you’re in a hurry. It usually only takes a few minutes to cook fish, and depending on how thin it is, you might not even have to flip it at all to make it. 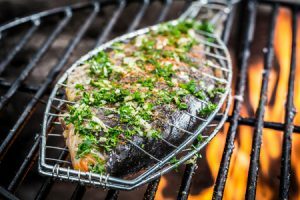 Simply brush your fish with oil, place it on a part of the grill that is away from the fire, and then check its color every so often to see when it’s done. You should also flip the fish if you see grill marks forming on it. Unlike grilling fish, steaming fish can take a bit longer. But it will be well worth it in the end as steaming fish will produce a milder tasting fish that you can pair with a number of sauces. To steam fish, begin by rubbing it with herbs, garlic, and other spices to inject flavor into it. Then place the fish into a steaming basket before putting it into a covered pan with about 1 1/12 inches of water in it. Bring the water to a boil and allow your fish to cook while checking it periodically to see when it’s done. Baking fish can give you the crunch that often comes along with frying fish without the unhealthy aspects of it, provided, of course, you don’t coat your fish in butter or oil. Prepare your fish and then stick it into the oven while checking on it to see when it’s finished. Baked fish goes great with a side of vegetables and will be healthy when prepared properly. Now that you know some of the ways to cook fish, why not go out there and catch some so you can start eating? Mattice Lake Outfitters can set you up with a fishing trip that will yield more than enough fish for you to eat. Call us at 800-411-0334 today to arrange for a fishing trip in the near future.